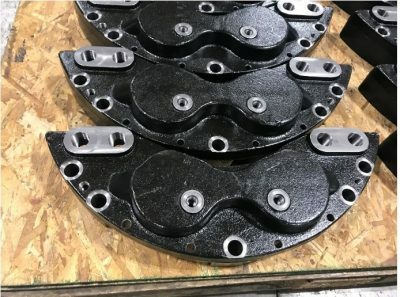 Knott Brake Company designs and manufactures industrial brakes and brakes for road-going trailers towed by other vehicles in Lodi, Ohio. Made in Medina County had the opportunity to meet with the President and CEO, Joseph Kott, to learn about their operation. Q: Please tell us about the name of the company. Do we pronounce the K or “knot”? A: I see what you did there – yes, you do pronounce the K because in German there are no silent letters. 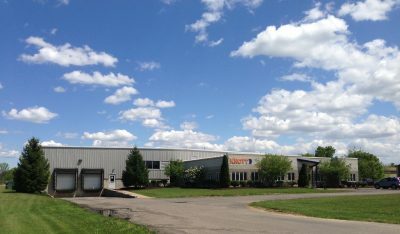 The Knott family started the company in Germany in 1937. Could you please share with us the history of the company and how it came to be located in Lodi? A: My father came to this country following his mother after World War II from Germany. He met my mother and her family was from Medina County so they settled here. He was a sales engineer where Knott Brake was his customer. When the Knotts wanted to establish a location in the States, it was a logical choice to call on my father. He launched the location out of the basement and everything was imported. But as time went by, he was able to grow our presence and build our manufacturing plant. We have been in the States since 1987. I’m happy to say I was an early employee helping Dad get things going. Today, a majority of our products are American Made. Q: How is Knott organized across its brands and products? A: We have two product groups. 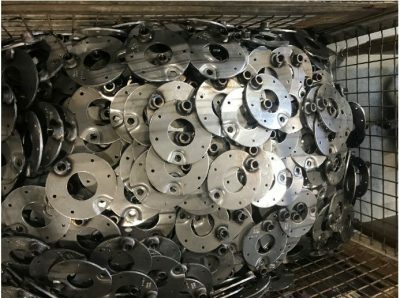 Primarily we manufacture industrial brakes for equipment that are not planes, trains, or automobiles. We supply brakes for mining vehicles, military equipment, agricultural equipment, and commercial mowers. The other group is for road-going trailers to haul equipment that is not allowed to be driven on the roads. This is mainly seen in Europe, where they have strict rules as to what equipment is allowed to drive on the roads. Q: What are some exciting or interesting projects you’ve done? A: We have a couple interesting projects that have come up in the last few years. We like to take on the challenges others don’t and we dig into the details to make sure the solution fits the goals of the project. One was a woman who shows dogs professionally. She needed a way to exercise the dogs before shows and had developed what was a large hamster wheel. The problem was she didn’t have a way of slowing it down and stopping so the dogs were falling off or tripping when they were done. She found us online and we developed a braking system that works with the animal. We were also responsible for creating a brake system used to simulate the Mars rover for NASA. Our system had to give the experience of landing on Mars which was a really interesting challenge. But the one we really sank our teeth into recently was for a mower manufacturer. The braking system specifications said the mower had to be able to sit on a hill of a specific incline for so many minutes running without a braking problem and their previous vendor had met those specifications. But, customers routinely called with brake problems. We recognized that there was more going on here than anyone realized so we did the research and determined the average customer was pulling the mower into their trailers and not tying them down as expected. That was putting a lot of stress on the braking system and we developed an entirely different product than the original. Q: To what do you attribute your company’s success? A: You have to build a great culture, then great people will come and stay. Like the quote from the movie “Field of Dreams,” “If you build it, they will come.” We also function on “productive paranoia”. It is really the heart of what we do because everything we do is about controlled stopping. All vehicles will eventually stop. It’s vital that it be a controlled stop and one the user is anticipating. And, our engineers are putting their names on projects designed to mitigate risk. They have to be able to be paranoid about potential problems but we have to keep it productive so we don’t get caught up in “what ifs”. Productive paranoia helps us anticipate potential issues and really think through consequences. From dealing with disasters to getting a big order, we want to avoid any negative consequences by being ready with a plan. This allows us to continue working successfully. Our sales team partners with customers to teach them about the braking system mechanisms to ensure we provide them with the correct, quality products they need. Also, our people perform a lot of testing, design, and re-testing. They stick their necks out every day in order to keep people safe through controlled stopping. Sure, it’s one thing for a vehicle to be running, but we are concerned with it stopping safely. Q: How do you maintain your culture? A: The only way to maintain a good culture is to get the right people, in the right seats, doing the right things, and following our values. To get people in the right roles, they need to know and understand the role, they must want to do the role, and be capable to do what’s required of the role. If you don’t have this, people will not be happy or do a good job for the better of the company. Values are also very important to us. We want our employees to share and believe in our values. One of those is training. It is vital to us to provide all employees consistent training both onsite and off. Q: How many employees do you have and how do you develop your workforce? A: We are looking to add mechanical and quality engineers, manufacturing, and customer service personnel as we approach 50 employees. We feel strongly that training is a key tool in our workforce management because keeping our good people up to date on their skills and learning new ones benefits us all. We work with the Medina County Career Center and the University of Akron’s Medina Center to provide training that is essential to our company and industry. We also participate in Medina County Economic Development Corporation’s Manufacturing Roadshow program. In 2016 we were part of Made in Medina County Day and will do that again in October. Q: What does the future look like for Knott? A: The future is looking bright. We definitely have our sights on what will happen with tariffs and NAFTA, but will plan accordingly. We are completely focused on growth. For the next 10, 20, 30 years out we are planning for growth, both internally and externally. We look forward to seeing the growth of this local business in our community! For more information on Knott Brake, visit the company’s website.